Our daily chore routine has taken trial and error to see what works for us. However, we’ve finally settled on a good schedule that has been working out well for about a year now. I really struggled with keeping my children focused on their chores each morning. That is, until my husband graduated college and was home in the mornings more. He came with up with a creative way to motivate our children and since we started it last year it has greatly improved the chore performance. Before when we required chores to be done, breakfast and school just got pushed further and further back. Our children had no incentive to complete their chores and get on with their school day. We finally decided to set a firm time for breakfast – in our case 9 AM. If our children decide to dawdle and not to get dressed and complete their chore by 9 AM, they miss breakfast and have to continue working until they are finished. What a difference this made! Now they (usually) get up and hurry to get their chores done! It isn’t perfect, but it has been a big help in motivating them each morning. I will be quick to add that we give them grace in this. If we are up late, we let them sleep in and just tell them to quickly get started. If they had an extra big job that morning, we give them grace. But the general rule is for chores to be done by 9 AM, and we normally eat and get started with school around 10:00. Oftentimes I’m wrapping up business work from 9-10 each morning. It’s helpful for me to have visual reminders of what the children are capable of doing. I especially lose focus on what my little ones are capable of doing when I have older helpers around. 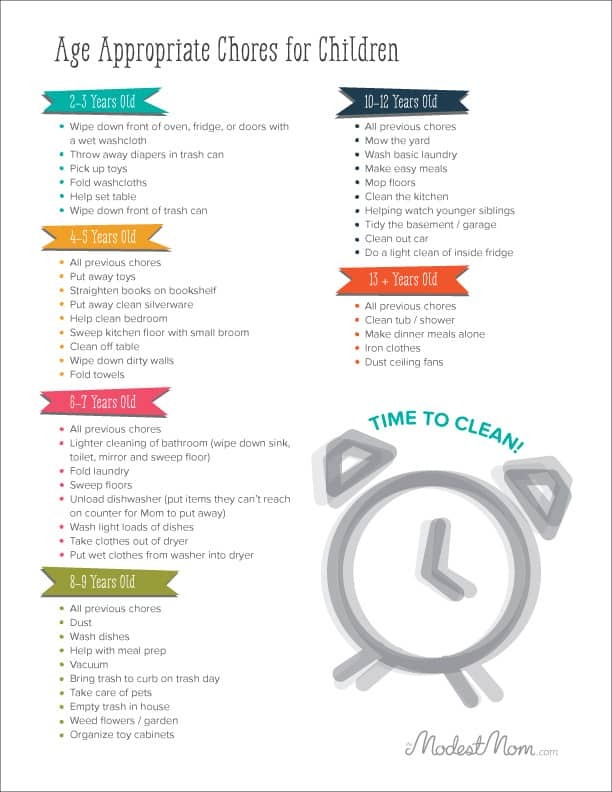 This age appropriate chore chart is helpful to print and put somewhere (like your refrigerator) for a quick reminder of a chore you can assign to your child! I hope you find it helpful! 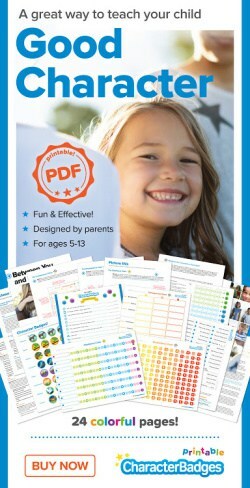 Fill out this form to receive the free printable! So what chores do our children do each day? We stick to a very basic routine. Each child has around one chore they have to do each day. We don’t alternate much and we change chores about once a year as the children get older. 9 year old boy – Right now he alternates one morning sweeping the dining room floor and cleaning it, and the other morning he does a light cleaning job in the bathroom and normally brings up a load of laundry for me from the dryer. 6 year old girl – She alternates chores with our 9 year old. She does such a good job with her chores and works hard to get them done properly. 5 year old girl – She is in charge of cleaning the girls room each morning, and a few times a week she cleans the outside of the kitchen trash can with some natural cleaning spray and a rag. I don’t require her to get their bedroom totally clean, as that is a big job for her alone. But she has to work on tidying it up each morning. 3 year old girl – She floats around the house during this time, and I sometimes come up with a simple job for her to help with. 🙂 A few of the jobs she does is pick up toys and she cleans the front of the oven with natural spray (sometimes LOTS of natural spray, lol). I would love to hear how your household handles morning chores! 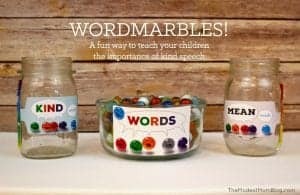 Wordmarbles- A Fun Way To Teach Children Kind Speech! 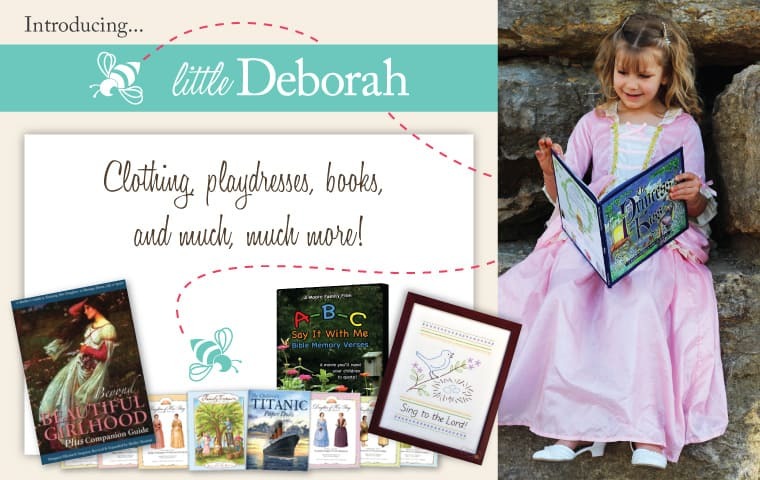 Looking for play dresses, books, media, toys or more for your little girl? Check out Little Deborah! While there you can browse the clothing available for women and maternity! Our children are still very young – 4, 2, and 1 – and therefore they are unable to help much…but I do have them help with small things (please throw this in the trash, please put this in the dish towel drawer, please get me a kleenex, etc). Just to get them used to helping. Our 4 year old loves to help me sort laundry, and he begs me to let him “wash dishes” (I leave the small plastic things in the soapy water for him to “wash” – it entertains him for a long time!). At the end of the day I have the kiddos pick up their toys in their room and living room (I am so afraid of tripping on something at night if I have to get up to help one of the kids). My 3yo (4 next month) is able to wash dishes (not perfectly, so I rinse to make sure things are clean), sweep, vacuum (she has her own little stick vac that she’s really proud of), and wipe down table and counters. She wants to help clean the cat box, but I discourage that for now (when she insists, I let her hold the bag and make sure she washes her hands after). She also sometimes helps me clean the bathroom. She doesn’t do all of these every day, some days she’s much more help than others, but she’s always proud to help, and she loves the extra mommy time. Sounds like you are doing a great job training her in chore time!! What kind of setup do you use for dishwashing? My daughter is two and I’m looking for a way to start safely involving her in kitchen counter activities. I hope it is helpful!! In comparing the “2-3 Years Old” and “4-5 Years Old” areas, what is the difference between “Pick up toys” and “Put away toys”? To me they seem like the same thing. Also I know that this is a “mommy” blog but in the “6-7 Year Old” area it says “Unload dishwasher (put items they can’t reach on counter for Mom to put away)”. Does this mean that an older or taller sibling or Dad couldn’t help? My 2-3 year old can pick up blocks, or hand me toys, but she isn’t good about knowing exactly where containers of toys should be put away at, actually cleaning her room where she can pick up an item and know where to put it. My 5 year old has a better concept of where items actually belong, versus just picking up an item. I guess I have a “boy genius”, but I jest. My son is almost 2 years old and has no problems taking apart his IKEA train set, putting it in a plastic bin, and carrying that container to the shelf that we have. He does similar things with other toys as well. I figured your response would be “yes” for helping with the dishwasher. I simply wanted to raise it because chores can really be done by anyone, not just mommy or daddy. That creates burn-out. Stick vacs are the BEST. My boys have been fighting over the right to use ours since they were 2 and 4. 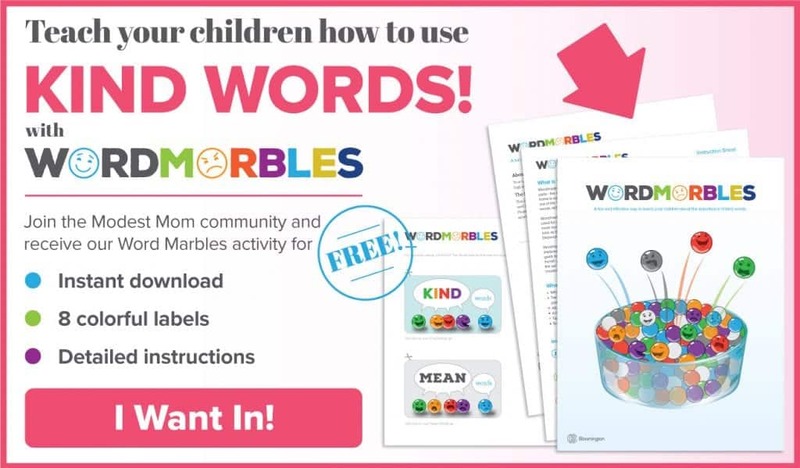 If you have Montessori children this list is wacky. My two-year-old folds laundry, washes windows, puts away silverware, puts toys away, straightens bookshelves, essentially everything on the lists through 7 years old. Now, his work may not be up to my standard, and I may have to help a little bit, but very small children are capable of so much more than we give them credit for. Thanks for the post. It’s really interesting to see how different families go about this. I don’t expect my children to do any chores, as my husband and I have it covered, but it sometimes happens naturally anyway. I admit, I do sneakily rearrange and flatten out the drying washing after my 5 and 2 year old hang it out for me as a surprise! One chore per day is perfectly reasonable. However, could I make the suggestion that you make that clear in regards to the “age appropriate chore list” that you’ve posted? I came across the chart sitting alone on “StumbleUpon” (with your site address but without your blog post attached), saw about a half-dozen chores listed for every age with “all previous chores” listed under each new subtitle, and felt annoyed enough to come over to your blog to complain about kids being forced into a little orphan Annie-esque existence of nothing but chores, chores, chores! And what gets me about lists like these are that there’s never any mention of the adult’s role: are they leading by example and pitching in, too, so that the kids can see them making their own contributions to household cleanliness? If not, then the chief lesson learned is resentment.